20-Apr-2016 The Tapestry crosses over to New Zealand! 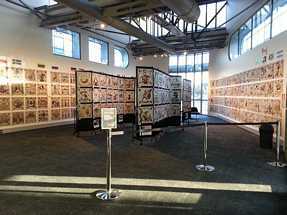 The Scottish Diaspora Tapestry, which will be on display at Toitu Otago Settlers Museum later this month, is bringing together Scottish settlement stories from around the world in more than 300 embroidered panels. 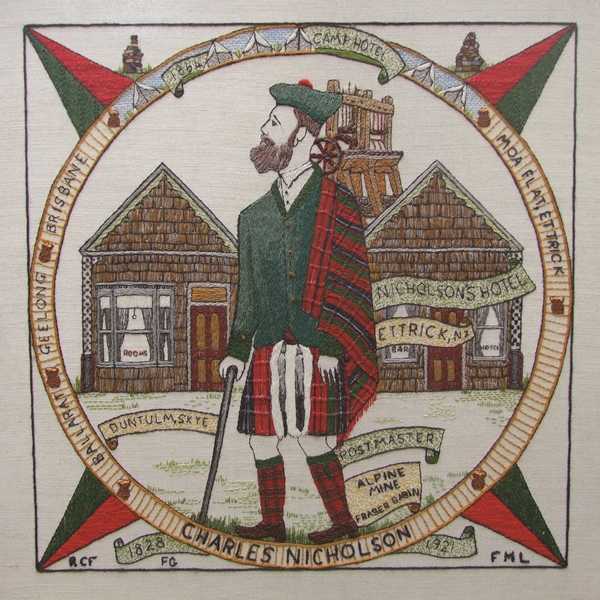 Charles Nicholson of Dunedin's tale is depicted here below in Panel NZ 07* stitched by Fiona Lundy, Rosemary Farmer and Frances Gardner; and yes he would have been speaking the Gaelic! Museum Curator Sean Brosnahan says, "Wherever they might have ended up - from China to New Zealand to Brazil - Scots abroad have taken with them some universal symbols to express their Scottishness: tartans, piping and dancing, whisky and haggis, curling and golf, ceilidhs and Burns Nights. On tour since 2014, these panels highlight Scottish contributions to each country or region, whether as explorers and engineers, musicians and politicians, scientists and educationalists, and so much more." 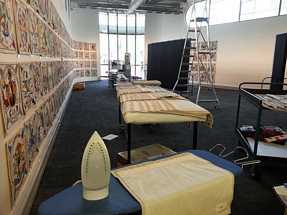 The exhibition will run from Wednesday, 13 April until Thursday, 28 April. The project catalogue says, "Scots have migrated all over the world and have often had a profound impact on the areas where they settled. This project is a remarkable and heart-felt homage to the determination, courage and achievement of Scottish migrants and their descendants across the centuries." Museum Visitor Experience Manager Kirsty Glengarry says, "Toitu OSM is thrilled to present the Scottish Diaspora Tapestry project. Dunedin is the only New Zealand venue and when Dame Elizabeth Hanan contacted the Museum about this touring project it was clear that we should display this work. 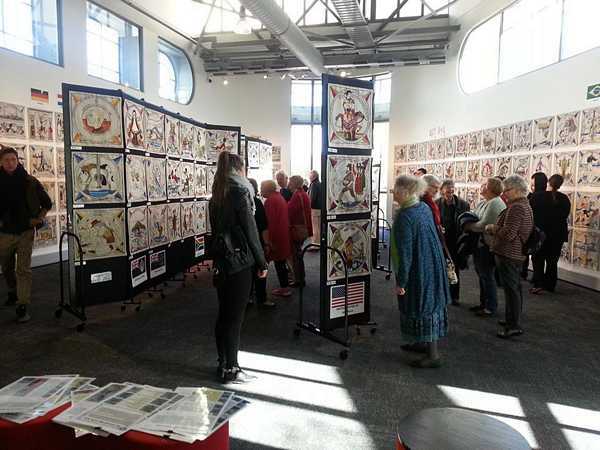 "Local embroiderers will be demonstrating their work in the exhibition space and we look forward to welcoming lots of visitors during this time." Two talks will be on offer for visitors too. Tour Director Jennifer Bruce will discuss the Scottish Diaspora Tapestry on Sunday, 17 April at 2pm and Jeanette Trotman will discuss the New Zealand tapestry project, New Zealand in Stitch, on Sunday, 24 April at 2pm. NZ 07: *Teàrlach MacNeacail - Rugadh Teàrlach MacNeacail ann an Dùn Tuilm san Eilean Sgitheanach do Sheumas MacNeacail agus Mairead NicDhòmhnaill. Ann an 1851, sheòl e air an St Vincent gu Sydney, Astràilia. Anns an aon phàipear-naidheachd ri ‘Litir gu na Mèinnearan’ aig Gabriel Reid ann an 1861 mu achaidhean-òir Otago, bha seòladh an “Omeo” gu Dùn Èideann. Ann an 1864, bha Stòr, Oifis Puist agus “Taigh-òsta a’ Champ” faisg air Flat a’ Mhuilleir, aig Teàrlach. Phòs e boireannach òg Hanobhàirian, thog iad teaghlach mòr, agus e a’ leantainn air le Dreidseadh Òir agus Mèinnearachd, Poilitigs agus ag adhartachadh Sochair Mhèinnearan, Spòrs is Foghlam. B’ e a cheann-sgrìobhaidh: “Creideas, Dòchas agus Gràdh, agus is Gràdh as motha dhiubh sin”.